Google is gearing up to be the go-to place for Rio Olympic Games information. “Next week, the 2016 cauldron will be lit in Rio de Janeiro, Brazil, where thousands of athletes will come together to represent the strength and pride of their home countries with the world as their audience,” says Google Product Manager Jonathan Livni, in a post on the Google Search blog. “In celebration of the next chapter in Olympics history, we’re bringing the best our products have to offer to help people around the world stay up-to-date with the Olympic Games Rio 2016. 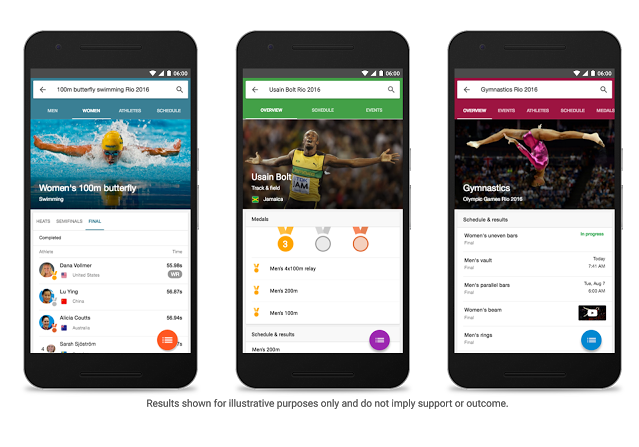 “If you search on the Google app on Android and iOS, you’ll also see an option to get automatic updates on top event and medal wins, so you’ll never miss a beat,” says Livni. YouTube is sending 15 of their top creators to Rio to live stream everything except the games themselves, because NBC will be broadcasting these considering they paid $1.226 billion for the rights! You can also watch NBC and other official broadcasters’ video highlights on YouTube in more than 60 countries around the world, including the BBC (U.K.), America Movil (Latin America excluding Brazil), NHK (Japan) and many others. Google will link all of these official broadcasters’ highlights directly into Google Search and YouTube Watch Cards for the Rio Games. According to the YouTube Summer Games Report by the Google Trends team, the majority of time spent watching sports content happens on mobile. In the past 12 months, mobile devices accounted for 65% of Olympic sports videos global watch time. Sports related content drives fans not just to YouTube, but to search as well. The Games are motivating more searches globally than the last World Cup and past two UEFA European Championships. Brands are also heavily committed to the Rio Games, uploading ads celebrating the athletes, culture, and passion around the Olympic Games, and they are being watched in big numbers. With Street View in Google Maps you can enjoy Rio in all its glory even if you are not physically there.